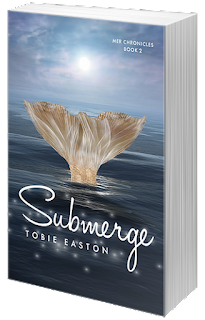 So Few Books ~: BLOG TOUR & AUTHOR INTERVIEW with Tobie Easton for "Submerge (Mer Chronicles, #2)"
BLOG TOUR & AUTHOR INTERVIEW with Tobie Easton for "Submerge (Mer Chronicles, #2)"
The idea for Emerge came to me while I was swimming laps (seriously!). As a kid, every time I went swimming, I pretended to be a mermaid. I was remembering that while I was swimming laps, and I started to wonder what life would be like for mermaids who lived on land. That’s when my brain started spinning the story for what would become Emerge, and eventually, the rest of the Mer Chronicles series. I want each reader to make up their own mind about what the themes of the story are to them. I will say, one important element of the book is its moral ambiguity, which is something we all have to learn to cope with more as we grow older. Also, Book 1 was very much about learning when to break rules, and Book 2, as an extension of that, focuses more on the personal consequences of breaking those rules and how your sense of yourself evolves as you grow up. Book 3, which I’m writing now, is about making your own rules. Anything deeper is entirely up to the reader. All my characters have at least some small piece of me (which I think is how I connect to each one of them and find their voices). Lia, the protagonist, is a lot like I was in high school in terms of the way she thinks and how she expresses herself. Her oldest sister Emeraldine is a lot like I am now. Both consider love invaluable. I also really relate to Caspian’s love of learning. And I wish I were as cool and witty as Lia’s twin sisters, Lapis and Lazuli. The only character who is very similar to someone in real life is Lia’s dad, who is a lot like mine. Most definitely my mom. She’s the one who instilled in me a deep love of words. She also gave me the confidence in myself that you need as a writer because the publishing industry can be hard and entails a lot of rejection. My mom’s influence is very present throughout the series because she raised me to question fairy tales as well as to love them. Wow. What a fantastic question! My answer definitely involves Professor Snape and a game of Pretty Pretty Princess! You know, the one where you have to put on all the plastic jewellery in the same color to win? I loved that game as a kid, and I can just picture Snape glowering in one of those colourful plastic necklaces with matching earrings. Blog Tour Schedule for "Submerge"